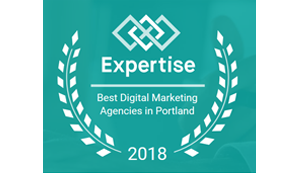 Spot Digital Marketing has the honor of being named one of the top Marketing Agencies in Portland, Oregon! This award comes from Expertise, after a thorough evaluation of 148 marketing agencies that are currently serving the Portland area. Spot Digital topped their list of 19 digital marketing agencies in Portland, Oregon for 2018. The goal of Expertise is to connect people with the best local experts by checking over 25 variables across various categories, and the Spot Digital Team is ecstatic to have ranked so highly for our second consecutive year! Spot Digital Marketing’s journey started over 17 years ago. We are led by our founder and owner Nicole Weber, who has worked professionally as a graphic designer and art director for over 20 years. She took her vision of an honest and transparent agency and grew it into a full-service marketing firm that serves businesses in Oregon and across the nation. Collectively, we are marketing experts, project managers, graphic designers, web developers, copywriters and digital specialists; we love what we do and seeing our clients’ tangible business growth come to fruition is our biggest reward. SEO: We use content and backlinking strategies to increase keyword relevance and organic ranking for your website to ensure potential customers find you online. PPC: We are a certified Google Partner using a continual optimization strategy including A/B testing for Pay-Per-Click campaigns to produce a successful ROI. Geofencing: Spot Digital Marketing creates and manages geo-based digital campaigns to reach hyper-local audiences and demographics in a geocentric area around a business. Content creation: Our marketing specialists take a strategic approach to writing content to craft stories that articulate and highlight a clients brand. Text message marketing: The marketing team at Spot Digital are experts with text message marketing campaigns. With a 95% delivery rate and a 98% open rate, these campaigns get your brand in front of relevant and active consumers. Website development: Building functional and responsive websites that attract and convert new leads is a passion of our web development team. Our specialists are dedicated to your project and focus on content and imagery that will best resonate with your target audience. Brand creation: New or existing, we want to improve all the strengths of your brand. Our experienced design team works closely with clients to ensure the identity is consistent and engaging with consumers. If you are ready to see what the experts at Spot Digital Marketing can do for you, fill out our contact form. Not sure where to begin? We offer a complimentary SEO audit to those who visit our website. Once we gain an understanding of a company’s digital footprint, we can help you construct a clear and concise marketing plan. All other inquiries can be sent to us via email.